How to ask for an identification? This part of the site is dedicated to the Liege guns manufacturers and more particularly to its Golden Age (1814-1914) with extrapolations over older times and the contemporary period. We will try to help gun aficionados, worldwide, to identify, date, and deepen their knowledge or simply to discover our exceptionally rich heritage in this field. In the Principality of Liege, fire arms appeared early, i.e about 1350. Their production knew a dazzling boom in the first half of the 17th century (30 years War and other international conflicts as well as its ideal geographical location contributed largely to this development). Under the French period (1794-1814), many gun manufacturers were reduced to unemployment, the reduction of business opportunities and the monopoly of the Manufacture eliminated from the market 90 percent of the specialized workers, those who were making trade and luxury guns . - evolution of mechanization: the proliferation of sheet metal rolling mills in the Ourthe and Vesdre valleys at the end of the 18th century, the Company John Cockerill factory, founded in 1834 in Valley-Benoit, as well as the advent of the first machines to mechanize metal gun parts and the wood for rifles, in about 1851 (Falisse and Trapmann), are three examples among others. The number of manufacturers does not stop increasing: 36 in 1816, 97 in 1856, 174 in 1884 and 195 in 1909 to which we must add 75 gun parts manufactures and 13 of gun stocks. What should we understand by manufacturers? They were primarily gun merchants having their guns manufactured by craftsmen working at home, who took delivery of them and sold them with a profit. To face important orders (military, trade or luxury guns), they create a temporary partnership with several competitors while carrying on their own activities. Before 1914, only two companies were able to entirely manufacture weapons in workshops: the FN and Établissements Pieper. In order to gather, for the Liege workmen a sampling of guns with didactic purposes and thanks to the patronage of the gun manufacturer Joseph Lemille, the Liege Arms Museum has been organized and opened in 1885. 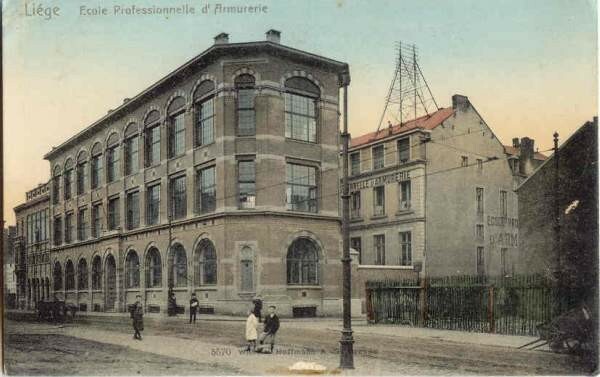 The question of a specific vocational training, which was posed to face the constraints of extreme mechanization and the preoccupation of a lucrative productivity, led to the creation of the Arms Manufacturing School (Leon Mignon) which opened its doors on February 8, 1897. Originally it was managed jointly by the gun manufacturers, the State, the Province and the City of Liege. It is not easy to pinpoint the share going to the Liege people in the development of the portable weapon in the 19th century, but, between 1830 and 1907, there was not less than 6.331 patents granted in Belgium in this field. Production: the first known official figure is of 107.173 guns tested in 1823 and the absolute record is located in 1907 with 1.549.479 tested guns. This industry impressed all the people of the world by his level of activities, by the variety of its products, their moderate price and the universality of their dissemination. Administrator ASBL Friends of the Museum of Weapons.